OF THE ENTIRE OGDEN VALLEY! Ridge #202 is a 3 Bedroom / 3.5 Bathroom Luxury Townhome located in Eden, UT in the beautiful Ogden Valley and Wolf Creek area. Located 15 min. from the World Famous Snowbasin Ski Resort and 10 min. below Powder Mountain, two of Utah's VERY BEST Ski destinations! Enjoy weeping, elevated 180 degree views of the entire Ogden Valley, perfect views of Snowbasin ski resort, Pineview Lake, Huntsville, Ben Lomand peak, Mt. Ogden, Nordic Valley ski area. This one of a kind, 2,200 sq ft. luxury town home is brand new to the rental market. 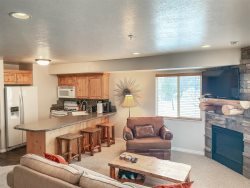 Ridge #202 is a 3 bedroom / 3-1/2 bathroom luxury townhome located in Eden, UT in the beautiful Ogden Valley and Wolf Creek area. Located 15 min. from the world famous Snowbasin Ski Resort and 10 min. and just below Powder Mountain, two of Utah's very best ski destinations! * Luxurious and very comfortable "mountain modern" style furnishings decor. * NEW PILLOW TOP beds! * Private heated 6 person jacuzzi with views of the entire Ogden Valley and Snowbasin. See pics for view, it's unbelievable any time of the year. satellite radio. There are two of these set-ups! * Radiant heated floors on the lower level, and tile and gorgeous carpeting on main level living and bedrooms. * Full size, Maytag top of the line washer and dryer in separate laundry room with sink. * Available 1 car garage to park and store additional sporting goods, ie. bikes, skis, etc. additional guest parking available. You won't be disappointed and will want to return year after year. Remember, we're conveniently located just one hour north of SLC and the SLC International airport. Thank you for looking at the Ridge 202 at the Wolf Creek Resort!